Can you ever go overboard on the self-promotion and networking? If you had asked me this question a few months ago, I would have had a different perspective. You can have all the talent in the world, but talent alone will not win you jobs if no one knows about it. I’m a firm believer that you must learn how to promote yourself and your capabilities often, to the right people and in the best light. I have gotten most of my voice-over work through my own self-promotion efforts. I am a perpetual student of marketing and publicity books and other resources. I observe what other people do both inside and outside the voice-over industry to see how I might apply the concepts to my business. I learned from Wayne Dyer that when you ask the Universe, ‘How may I serve?’, the Universe will respond by asking that question of you. If you are constantly in a state of saying ‘Gimme, gimme, gimme’, the Universe will respond by serving up that statement to you. You will feel like you are always striving and never arriving. The point I want to make today is that the needs of your audience still take priority over your own need to promote yourself. It’s not all about me, and it’s not all about you. After listening to a lecturer on our recent cruise, I compiled some guidelines about self-promotion when networking in social settings that you may find helpful.On our recent cruise, Drew and I met this guy while we were waiting to return to the ship from one of the islands. He told us he was a lecturer on the ship and proceeded to inform us about living in Hollywood, some famous people he knew, etc. As I have an interest in expanding my business with speaking engagements, I asked whether he lectured exclusively on cruise ships or in other environments. He was only too happy to tell me how he was the best of the best and got the job through an agent. He gave us a brief history of his life including his acting background, which prompted Drew to tell him about my voice-over career. The guy asked about my credits, presumably to see if he knew my work. When I said I perform a lot of corporate narrations and audiobooks, he made some comment about reading textbooks for the blind, as if he had dismissed me as someone beneath his exalted stature. I explained to him that commercial audiobooks are an $800 million industry and growing, in part because people are spending more time than ever in horrendous commutes. For instance, the average one-way commute in Atlanta is 34 miles! The next day, Drew and I were enjoying a perfectly lovely lunch facing the water on another gorgeous Greek island. Mr. Lecturer had already called out to us while we were walking around the town, and now here he was walking along the waterfront, headed straight toward us. I don’t know why I did it, but, before I could stop myself, the words were out of my mouth: I asked if he would like to join us. Naturally, he sat down. I didn’t know when I extended the invitation that he would spend most of his time sitting at our table and talking to the two crew members who happened to be sitting at the table next to us. The man found the topic of himself to be endlessly fascinating. He told us about being a contestant on Jeopardy and his history developing game shows. He related stories of speeches past and happy audiences who were mesmerized by his words. He never asked about us or noticed our needs that day. To be perfectly honest, we really didn’t care about his many past accomplishments because we would never be in a position to hire him. Maybe the retired senior crowd of fellow passengers would find him to be a sparkling conversationalist, but we thought he was obnoxiously boring. All we wanted to do was sit out in the sun at this amazingly pretty and romantic place that we may never see again and look at the village scenery set against the water. We couldn’t even do that because the guy’s head blocked our view. 1) Repeatedly ask yourself ‘how may I serve?’ when progressing the conversation. 2) Don’t talk endlessly about yourself. Other people lead interesting lives, too, and you may find out the answer to question number one by asking questions of others. 3) Don’t put down other people’s accomplishments to make yourself feel better. 4) No matter how talented you are or what you’ve accomplished in life, somebody else is always better or has done more. Don’t make bold, bragging statements like ‘I know I’m the best so they were wise to hire me’. No one wants to talk too long with someone who is a legend in his own mind. 5) Take your audience’s needs into consideration before you make your pitch. Are you on vacation in an exotic location? If so, the chance is very good that no one is interested in talking about business anyway. When Drew and I recently visited the Great Pyramids in Egypt, our attention was instantly focused on something. You might think we were riveted by the awe-inspiring majesty of the ancient structures that we were visiting. While we were certainly thrilled to be standing at one of the 7 Wonders of the world, we couldn’t totally concentrate on the moment as we defended ourselves against the onslaught of sales pitches of the many vendors who rushed up to us as we stepped onto the Sahara sand. If you stood still for more than a few seconds, someone would approach you, offering to sell you something, take you for a camel ride or shoot your picture. I began to think that the sellers outnumbered the tourists. People were hawking everything imaginable to remember your experience at the Pyramids: postcards, calendars, camels (both rides on real ones and small toys) coins, stamps, papyrus pictures, and, of course, head wraps. In fact, head wraps seemed to be the most popular item sold by the vendors, and most of the people appeared to have identical packages of white cloth which you would tie to your head with colored rope rings. These wraps looked like the traditional Arabian, white scarves with rope rings that you see in the movies. Most people were selling them for a dollar. When we went to the Pyramids, we didn’t have it in our minds to buy a souvenir of our visit. We and our fellow travelers had spent a lot of time, money and energy to journey to the Pyramids; all we wanted was peace and quiet to enjoy the view. All the vendors wanted was to use our limited time and waning energy under the desert sun to relieve us of money for their trinkets. In this setting of vendors barking their prices at us as we passed them, my marketing mind couldn’t help but think: How does a person selling a product that is the same or similar to his competitors distinguish himself in a saturated marketplace? The observations I made during my trip to the Pyramids are tips that you can easily employ in marketing and improving your voice-over business. Drew and me in front of the Sphinx and PyramidsOne of the more unusual selling approaches occurred when one person forced one of these white head wraps into Drew’s hands, started walking with us and told us he was giving us a free gift. Observation #1: The word FREE is one of the most powerful words in the English language. When someone offers you a free gift, you can’t help but feel intrigued. Of course, our society causes us to be cynical and look for the ‘the catch’ to any offer. In your voice-over business, you can entice people with free reports, free auditions, free script assistance, free revisions in short, whatever you feel adds value to your business without taking away from your bottom line. You ARE in the voice-over business to make money, aren’t you? He proceeded to ask us if we were American. When we said we were, he told us that he loved America and wanted to travel here someday. Observation #2: This seller was trying to create a relationship with us. People like to do business with those with whom they have a relationship. While everyone else was simply yelling prices at us, this guy was actually attempting to develop a rapport with us. Once he had established our nationality, the Pyramid peddler suggested that it would be nice if we could also give him a gift. (Ah, HERE’S the catch!) He didn’t specifically ask for money, but we knew he wanted money. We quickly gave the so-called free gift back to him. Observation #3: If you give away something for free, you can’t have any expectation of getting anything in return. If you anticipate a quid pro quo, you risk offending your prospects and a loss of any future sales. Observation #4: When you’re in a sales situation, you need to have a firm price for your product (as in voice talent and services) and be able to speak to people about the benefits they will receive from spending their money with you. 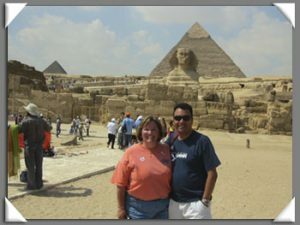 We also visited the Sphinx, which is located at the site of the Pyramids. Here, the peddlers offered the same merchandise as at the Pyramids but also added scarves and crystal Pyramids. Souvenir shops lined the road, but I didn’t see an official souvenir stand at either site. I suppose that anyone who wants to sell stuff could do so. We had successfully skirted around the sea of sellers while entering the chamber to the Sphinx. Our guide even shooed away one particularly pesky merchant by speaking rather sharply to him in Arabic. On our way out, though, Drew noticed someone selling a head wrap that was unlike the 100 he had seen prior in the day. All of the others were small pieces of white linen fabric, while this one was a large, black and white checked fabric similar to one worn by a former Mid-East leader. Drew stopped to inquire about it. Observation #5: Find a niche and fill it. I know that may seem easier said than done, especially when I’m talking about the voice-over industry, but we all have unique voices and unique backgrounds that we bring to the microphone. Figure out your signature sound, and find a way to use your experiences in your marketing. Also, if you have some tie-in to a celebrity, use it! Drew and the vendor haggled about the price of this head wrap for several minutes before Drew finally bought it at a price considerably lower than the dealer’s original price. 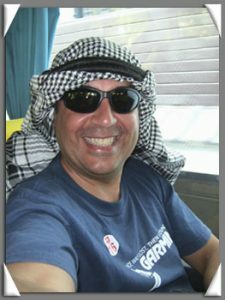 However, Drew did pay more for his head wrap than the white linen wraps seen at the Pyramids and more than he originally planned to spend. Observation #6: Just because everybody else in your sandbox is charging low prices and negotiating price cuts with every new prospect doesn’t mean that you have to follow the trend. When you cut your prices, you are the one who bleeds. If you want to charge and achieve a premium price for your voice-over talent, you need to be ready with factual, persuasive reasons based on quality, service or other aspects why the prospect should pay the extra money. For an in-depth and fascinating discussion of this subject, I cannot recommend too highly that you get Larry Steinmetz’s book How to Sell at Margins Higher Than Your Competitors: Winning Every Sale at Full Price, Rate, or Fee. Observation #7: Even in a market that is saturated with vendors, people are willing to increase their budgets to acquire a quality product that matches their specifications. Drew shows off his new purchaseFollowing the visits to the Pyramids and the Sphinx, we were taken on a Jeep safari and camel ride at the Saqqara Country Club near the 4000-year-old Step Pyramid, which we also visited. 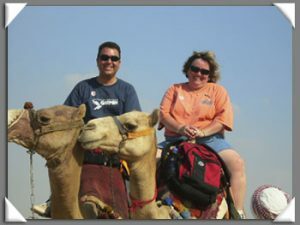 Both the Jeep safari and camel ride were included in the package price for the day trip to the Pyramids. Our camels were led by Bedouins walking by the camels on foot, and our guide told us that $2 was a customary tip for these ‘drivers’. Consequently, Drew and I each put $2 in our pockets with the plan to give it to each driver at the end of the ride. The camel ride lasted 30-40 minutes, which was longer than we expected. During the entire ride, our drivers kept asking if everything was okay. They were eager to please and ensure that we were having a good time. However, they didn’t know a lot of English, so the rest of the conversation consisted of constant requests for money at the end of the ride. I was uncomfortable during the ride because I only had one foot in a stirrup. I never found the stirrup on the right side, and I kept feeling like I would fall off the camel’s back. I told Moses, my driver, about this problem numerous times. Maybe he didn’t understand me since he would respond by telling me about needing money to feed his wife and 5 hungry children. Observation #8: If your client reports a problem to you, you should fix it immediately. Listen twice as much as you talk. Do everything in your power to maintain your client’s trust. My Sheik and me on our camel ride in the Sahara DesertWe decided that, contrary to the advice of our guide, the drivers deserved more than a $2 tip for the long walk and value-added service. Drew had a mixture of US and European currency in his wallet. He gave a US $20 to Sami; however, he gave Moses a 20 Euro, which was worth around $25 due to the exchange rate. Even though Sami took pictures of us and gave Drew the reins of his camel, Drew paid Moses more because Moses was taking care of me. Also, Moses was also missing many teeth and had a larger family than Sami. Drew wanted to do more to add to Moses’ prosperity than to Sami’s. Rather than thanking Drew for his generosity, Sami was jealous of the amount given to Moses and demanded that Drew give him $5 more. Drew refused. Observation #9: Do the best job that you can do and express gratitude for all of your blessings. Convey your appreciation to your clients for choosing you as their voice talent and for their prompt payment of your invoices. You would do well to set up a regular system to maintain contact with them that shows them you are thinking of them and their needs, not yours. Observation #10: We live in a global economy. If you don’t have a passport, get one. 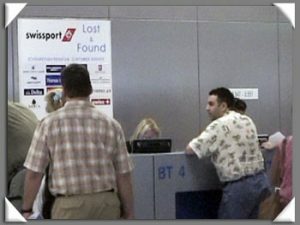 If you have a passport, use it. Travel the world to spend time in other cultures and see how other people really live as opposed to taking your world view solely from the things that the media chooses to tell you. I can’t promise that you will gain creative ideas about your voice-over business, but I can promise that you will gain a perspective about your place in this world and an appreciation for the abundant lifestyle you are privileged to lead if you are a voice-over artist. If you would like some help in making your selection, you will enjoy reading Stephen King’s recent column in Entertainment Weekly titled Hail to the Spoken Word in which he listed his top 10 audiobook recommendations. The discussion from readers is equally lively. While I record in my studio, a fascinating post on Sarah Weinman’s GalleyCat blog titled An Audiobook In the Making described the audiobook recording process to the world. Sarah takes us all behind-the-scenes with her to a studio session of Jonathan Lethem recording part of the audiobook version of his new novel YOU DON’T LOVE ME YET. By the way, if you’re interested in audiobook work, I cannot recommend too highly Pat Fraley’s audiobook class. He has another session scheduled in Los Angeles on 2-3 December. If you contact him about it, please let him know that I referred you. If you’re an American, I hope you enjoy your Thanksgiving on Thursday. I give thanks that I am married to the love of my life, live in this great country and can do voice-over work for clients around the world from my home!